Life cycle: This insect produces one generation each year. Hibernation is accomplished in a cocoon within the soil. 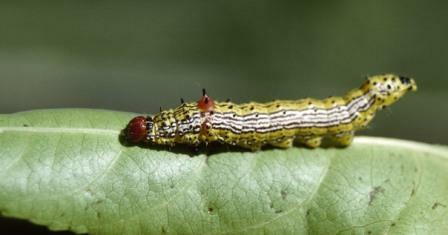 Physical Description: This 1 1/2 inch long caterpillar is yellow with red and white longitudinal strips, a red head, and a bright red hump on its back just behind the head. It has black spines and several segments. The adult moth is gray to brown with a wingspan of 1 1/2 inches. The male moth also has dark markings. Feeding characteristics: This pest attacks apple, apricot, blackberry, cherry, pear, plum, sweet gum, and walnut plants by feeding in groups on the leaves of host plants. They can skeletonize the leaf as it clings to the foliage and branches. Controls: If you have but a few plants, remove the colonies by clipping off the infested parts and destroying them. Burning is the best way to dispose of the clippings. For more serious problems, you can apply Bacillus thuringiensis with either a spray or a dust.